Gossypol is a natural phenol derived from the cotton plant (genus Gossypium). Gossypol is a phenolic aldehyde that permeates cells and acts as an inhibitor for several dehydrogenase enzymes. It is a yellow pigment. Among other things, it has been tested as a male oral contraceptive in China. In addition to its putative contraceptive properties, gossypol has also long been known to possess antimalarial properties. Other researchers are investigating the anticancer properties of gossypol. Gossypol is a terpenoid aldehyde which is formed metabolically through acetate via the isoprenoid pathway. Sesquiterpene dimer undergoes a radical coupling reaction to form gossypol. The biosynthesis begins when geranyl pyrophosphate (GPP) and isopentenyl pyrophosphate (IPP) are combined to make the sesquiterpene precursor farnesyl diphosphate (FPP). Cadinyl cation (1) is oxidized to 2 by (+)-d-cadinene synthase. The (+)-d-cadinene (2) is involved in making the basic aromatic sesquiterpene unit, homigossypol, by oxidation, which generates the 3 (8-hydroxy-d-cadinene) with the help of (+)-d-cadinene 8-hyroxylase. Compound 3 goes through various oxidative processes to make 4 (deoxyhemigossypol), which is oxidized by one electron into hemigossypol (5, 6, 7) and then undergoes a phenolic oxidative coupling, ortho to the phenol groups, to form gossypol (8). The coupling is catalyzed by a hydrogen peroxide-dependent peroxidise enzyme, which results in the final product. In the 1970s, the Chinese government began researching the use of gossypol as a contraceptive. Their studies involved over 10,000 subjects, and continued for over a decade. They concluded gossypol provided reliable contraception, could be taken orally as a tablet, and did not upset men's balance of hormones. However, gossypol also had serious flaws. The studies also discovered an abnormally high rate of hypokalemia among subjects. Hypokalemia — low blood potassium levels — causes symptoms of fatigue, muscle weakness, and at its most extreme, paralysis. In addition, about 7% of subjects reported effects on their digestive systems, and about 12% had increased fatigue. Most subjects recovered after stopping treatment and taking potassium supplements. The same study showed taking potassium supplements during gossypol treatment did not prevent hypokalemia in primates. The potassium deficiency may also be a result of the Chinese diet or genetic predisposition. In the mid-1990s, the Brazilian pharmaceutical company Hebron announced plans to market a low-dose gossypol pill called Nofertil, but the pill never came to market. Its release was indefinitely postponed due to unacceptably high rates of permanent infertility. 5-25% of the men remained azoospermic up to a year after stopping treatment. The longer the men had taken the drug and the higher their overall dosages, the more likely they were to have lowered fertility or to become completely infertile. Researchers have suggested gossypol might make a good noninvasive alternative to surgical vasectomy. In 1986, the Chinese stopped research because of these side effects. In 1998, the World Health Organization's Research Group on Methods for the Regulation of Male Fertility recommended the research should be abandoned. In addition to the other side effects, the WHO researchers were concerned about gossypol's toxicity: the toxic dose in primates is less than 10 times the contraceptive dose. This report effectively ended further studies of gossypol as a temporary contraceptive, but research into using it as an alternative to vasectomy continues in Austria, Brazil, Chile, China, the Dominican Republic, and Nigeria. Gossypol is also under investigation as a possible chemotherapy drug, especially in its R- state. It is currently believed that gossypol in itself will not kill cancerous cells; however, it changes the chemistry within the cancer cell and makes it more susceptible to traditional chemotherapy drugs. Phased trials have been done on resistant prostate and lung cancer. Few results have been published to date, so no conclusions can be drawn. Gossypol has proapoptotic properties, probably due to the regulation of the Bax and Bcl2 genes. It also reversibly inhibits calcineurin and binds to calmodulin. It inhibits replication of the HIV-1 virus. It is an effective protein kinase C inhibitor. It also causes low potassium levels, and thus causes temporary paralysis. Food and animal agricultural industries must manage cotton-derivative product levels to avoid toxicity. For example, only ruminant microflora can digest gossypol, but only to a certain level, and cottonseed oil must be refined. Gossypol is toxic to erythrocytes in vitro by stimulating cell death contributing to the side effect of hemolytic anemia. ↑ Burgos, M.; Ito, S.; Segal, J. S.; Tran, T. P. (1997). "Effect of Gossypol on Ultrastructure of Spisula Sperm" (PDF). Biol. Bull. 193 (2): 228–229. ↑ Heinstein, P. F.; Herman, L. D.; Tove, B. S.; Smith, H. F. (1970). "Biosynthesis of Gossypol". J. Biol. Chem. 245 (18): 4658–4665. PMID 4318479. 1 2 Dewick, P. M. (2008). Medicinal Natural Product: A Biosynthetic Approach (PDF) (3rd ed.). ISBN 0-470-74167-8. 1 2 3 4 5 Gossypol. Malecontraceptives.org (2011-07-27). Retrieved on 2013-03-30. ↑ Coutinho, F. M. (2002). "Gossypol: a contraceptive for men". Contraception. 65 (4): 259–263. doi:10.1016/S0010-7824(02)00294-9. PMID 12020773. ↑ Polsky, B; Segal, SJ; Baron, PA; Gold, JW; Ueno, H; Armstrong, D (1989). "Inactivation of human immunodeficiency virus in vitro by gossypol". Contraception. 39 (6): 579–87. doi:10.1016/0010-7824(89)90034-6. PMID 2473865. ↑ Gossypol (Gossipol). Bioscreening.net (last updated 2008-07-09). Retrieved on 2012-06-09. ↑ Cottonseed Protein: From Farmers to Your Family Table. Medgadget.com (2006-11-22). Retrieved on 2012-06-09. ↑ Zbidah, M; Lupescu, A; Shaik, N; Lang, F (2012). "Gossypol-induced suicidal erythrocyte death". Toxicology. 302 (2–3): 101–5. doi:10.1016/j.tox.2012.09.010. PMID 23041711. Ibragimov, B. T.; Talipov, S. A.; Aripov, T. F.; Sadykov, A. S. (1990). "Inclusion complexes of the natural product gossypol. 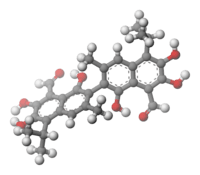 Crystal structure of the 2:1 complex of gossypol withm-Xylene". Journal of Inclusion Phenomena and Molecular Recognition in Chemistry. 8 (3): 323. doi:10.1007/BF01041888.